Inventory We are a resale marketplace, not a box office or venue. Ticket prices may exceed face value. This site is not owned by Rose Music Center . The Stuart & Mimi Rose Music Center at the Heights (commonly referred to as the Rose Music Center) opened in 2015 as part of a $19.3 million development for The Heights. The seating capacity is 4,200. The Rose Music Center box office is located at 6800 Executive Boulevard in Huber Heights, Ohio. Get used to the name because the Stuart Rose Family Foundation signed a lifetime naming rights agreement with the city. 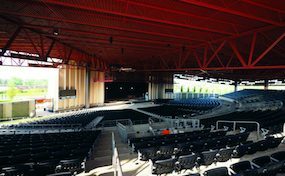 Rose Music Center tickets have included acts like Needtobreathe (opened the venue), John Legend, Willie Nelson, Jason Isbell, Vince Gill, ZZ Top, Doobie Brothers, and the Goo Goo Dolls. RoseMusic.CenterHuberHeights.com is a privately owned and operated company that concentrates solely in the online resale of all tickets in the secondary market. We are not currently affiliated with any official website, venue, and or box office. Ticket prices on our sites may fluctuate well above or below face value and can change quickly with market conditions. To order tickets for all Rose Music Center Huber Heights events please follow the steps online through the checkout or pick up your phone and dial our operators at anytime.